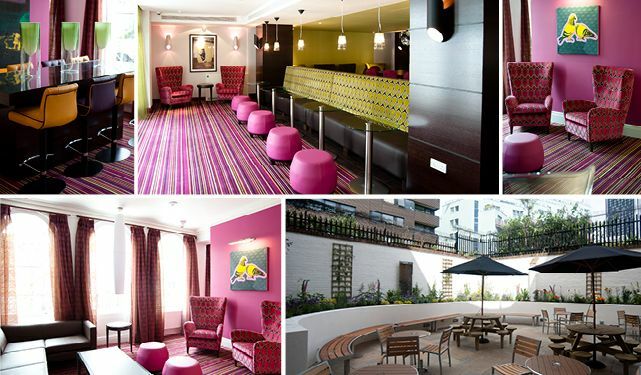 Safestay opened in July 2012 and is the first in a new line of contemporary hostels set to open across central London. Housed in a beautiful 18th Century Georgian building, formerly the Labour Party Headquarters, Safestay plays on the old and new in all aspects of its design, embracing London both past and present. Safestay’s bold design features bright interiors and standout artwork from emerging artists, including Banksy prints and Brit Pop Art. The furniture is eclectic with Tom Dixon bell jars, acrylic chairs, antique mirrors and bowler hats as light fixtures coming together to create a lively social environment throughout the communal areas. The 74 rooms are comprised of private twin rooms and family rooms with 40” plasma TVs and tea/coffee facilities, as well as four-, six- and eight-bunk bedded rooms, most with en-suite shower rooms. The bunk beds come with individual reading lights and curtains for extra privacy as well as lockers to secure luggage and personal items. Entry to the rooms is by touch key. The open-plan public areas on the lower ground floor offer a lounge area, plasma TV screens, a pool table, bar, and a restaurant that serves complimentary continental breakfast as well as snacks and meals throughout the day. French doors open out onto a courtyard garden with additional seating. Further facilities include: complimentary WiFi in the communal areas, a well equipped laundry room, free luggage store, a computer room and a library area. Additional Safestay properties are set to open across central London over the next three years. To have the chance to stay at this one of a kind accommodation for just £1 for a night simply head over to our Student Deals page now! Rates at Safestay start from £21 per bed per night. Private twin rooms are available from £66 per room per night.